The first CicLAvia event of 2014 will be held on April 6th which, as I type this, is only 13 days away. Boy howdy, this one snuck up on me! My first CicLAvia event was the “Heart of Downtown” ride in October 2012 and the extent that I enjoyed it took me by surprise. I’ve never been very fond of going to Los Angeles and when I had to go my primary goal was to take care of business so I could leave. To be fair, it’s not really an L.A. thing: I’ve felt the same way about most of the high-rise cities I’ve been to and I believe the traffic congestion is as much to blame as anything else. The unfortunate result of that attitude is I hadn’t paid much attention to the sights and sounds of L.A. and my lasting memories were all about the things I didn’t like. So an opportunity to tour some historic parts of downtown L.A. on my bicycle without having to deal with motorized traffic struck me as intriguing enough to give it a try. I knew I’d enjoy the ride, but I certainly didn’t think I’d enjoy the sights and sounds as much as I did. To make a long story short(er), I had a blast and I came away with both respect and admiration for the heart of downtown. I’ll add that I had a good enough time that I haven’t missed a CicLAvia since. 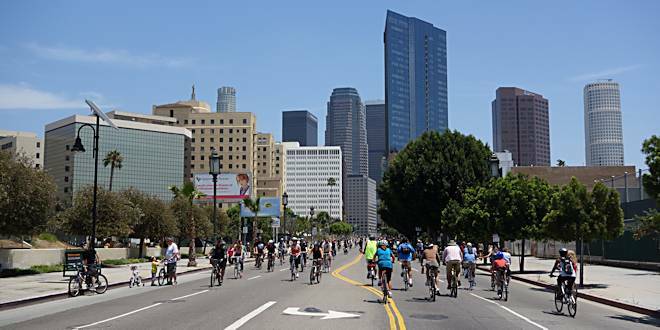 This particular CicLAvia route is a repeat of the last event of 2013 and it goes from the east end of Wilshire Blvd. at the One Wilshire building and heads west down Wilshire through the Miracle Mile to S. Fairfax Ave. In other words, it basically goes from the heart of Downtown to the La Brea Tar Pits. The route is 6.3 miles long, so a round-trip is 12.6 miles. BUT: There is no start or finish and there is no rule which says you have to ride the whole thing. In fact, you don’t have to ride any of it! You can walk, jog, skate, skateboard… It’s all good as long as it’s human-powered. One of the most interesting things about CicLAvia rides (to me, anyway) is the opportunity to stop and look without provoking road rage. If history is your thing then these rides are the perfect opportunity to explore and learn. If architecture is your thing there’s plenty of that too. The CicLAvia organizers have even put together a series of podcasts about some of the many things you can find along the route. I suppose I should mention security in this blog for those of you who might have reservations about your safety at an event like this: There are law enforcement personnel on every corner and anyone who misbehaves is dealt with promptly. Actually, I’ve ridden every mile of the “Heart of Downtown” ride (twice). the “To The Sea” ride, and last year’s “Iconic Wilshire Blvd.” ride and I’ve yet to see anyone misbehave. There are also lots of CicLAvia volunteers on the route who can help with anything from directions to fixing a flat tire and help with more extensive repairs can be found along the route. There are “Hubs” at both ends and in several spots along the route where you can find information booths, water, food, event-related merchandise, and banks of porta-potties. Of course many of the restaurants and other businesses along the route are also open. I live in coastal Orange County so I take my bicycle to the route on my car. I always park in the Joe’s Auto Parks #831 on Francisco St. because it’s near my end of the routes and access to/from the 110 is easy peasy, but there are countless other lots along the route and they’re all pretty cheap on Sunday. Remember: You can start & end your ride anywhere along the route so you can park wherever it’s convenient. You can also get to the route via public transportation if driving isn’t your thing. If you’re interested, you can view a whole set of photos I took during the 2012 “Heart of Downtown” event in my Flickr Photostream. The photo above is from last year’s Iconic Wilshire Blvd. ride.